Ixos delivers Divo 2.1 speaker system for TV, PC or iPod | What Hi-Fi? The Ixos Divo 2.1 is designed for use with TVs, PCs, games consoles, iPods or MP3 players. It can be added to a flatscreen TV to boost its sound, or as an iPod dock that will charge your iPhone/iPod and sync with iTunes via USB. 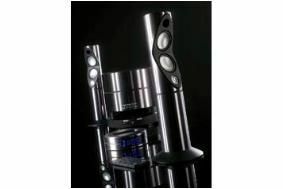 But it isn't just for iPods: stereo phono and a 3.5mm inputs mean that it can be connected to almost any audio source, boosting the sound via its 'mini tower' stereo speakers and separate subwoofer.